There's no need to pay through the nose for varmint ammo when you can get Wolf Performance Ammunition. These .223 Remington cartridges deliver deadly fragmentation and expansion that will take down coyotes, rabbits, and other pests quickly. 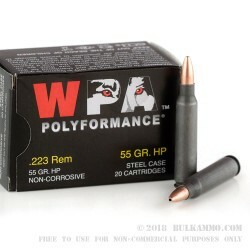 Each round in this box of 20 fires a 55 grain bimetal jacketed hollow point bullet with similar external ballistics to comparable full metal jacket loads, making it easy to use your existing optic settings. 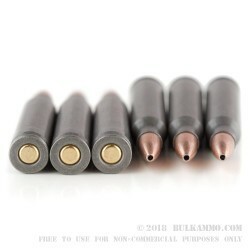 These cartridges are loaded in Russia using non-corrosive Berdan primers and inexpensive steel cases with polymer coatings that enable them to deliver the same reliable cycling as brass-cased ammo. 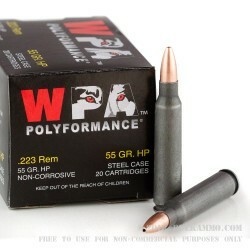 This ammo cannot be reloaded and may not be suitable for all indoor ranges due to its steel components. Good ammo if you have a gun made to shoot it!